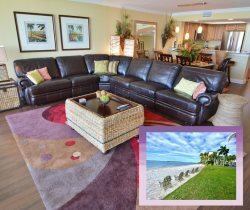 This Sanibel Harbour vacation rental is a beautiful corner unit with upgrades throughout the unit. Sunrise views, large wrap-around screened-in balcony newly furnished. Views stretching across San Carlos Bay to Sanibel Island. A professionally decorated unit with many upgrades. HD TV and DVD player in the Living Room with HD TV’s in both bedrooms. King bed in master bedroom and two twins in the guest bedroom. If you’re looking for Sanibel Harbour rentals with beachfront views, reserve Bay View Tower 1037 today. You may have found this rental on HomeAway 4363829, VA ID 4363829, VRBO 4363829ha, or Vacation Rentals 4363829. Our stay in the condo exceeded our expectations and will come back soon! We rented 1037 for a short girls trip. It was a beautiful and very comfortable condo and the best aspect was the 10th floor screen deck. From that vantage point you got lovely, expansive views as well as both sunrise and sunset! What a spot. We never had to fight for lounge chairs at the pool or the beach. We were able to get easily to Sanibel or Fort Myers. If we had stayed longer we could have purchased passes for the resort to use those amenities but we were quite content. We loved this rental and will very likely return. Thanks! We had small issue with some screen damage by a chair on the balcony after an extremely windy night. One call to maintenance had it resolved and repaired immediately. We visited during a week of tournament baseball and could not have been happier. Our rental was clean, beautiful and had many amenities available to us. Would definitely stay here again.